I have been exploring limited palette options again and came up with this set. This is an unusual palette of watercolours for me as it doesn't contain Ultramarine, my favourite blue, or Burnt Sienna, my favourite earth orange, and it does contain Quinacridone Magenta though that is not a favourite! Note this is called Purple Magenta in Schmincke or Quinacridone Lilac in Daniel Smith - who added this pigment to their range in 2017. I find it a difficult 'real world' colour and would generally rather use a rose or crimson. However, PR122 is an amazing mixing colour which, like phthalo green, can transform other colours beautifully and mixes very cleanly but in my opinion is best not used alone. This quartet of colours is designed to be transparent, bright and non granulating - a bit like working with inks - and works beautifully! It is based around a fabulous pair of transparent watercolours - Transparent Pyrrol Orange DS and Phthalo Blue RS DS. These neutralise each other completely to create a fantastic range of greys, black, warm browns and burnt oranges. See the first colour mixing row 1. Other manufacturers make Phthalo blue RS (or Winsor Blue RS) but I have not found an alternative brand for this orange. Schmincke make Translucent Orange with the same pigment but it is not as red. (see separate post on oranges and blues) QoR also make a transparent pyrrol orange but it is not the same hue. As mentioned in the comments below, I'd recommend using Daniel Smith with or without Schmincke for this set, but I find W&N colours can fight with DS colours so I don't suggest mixing those brands. Hansa Yellow Medium PY97 Daniel Smith, Purple Magenta PR122 Schmincke (or use the new DS Quinacridone Lilac), Phthalo Blue R.S. PB15 Daniel Smith and Transparent Pyrrol Orange PO71 Daniel Smith. To make oranges and greens a mid yellow is added - Hansa Yellow Medium PY97 DS, though it could be Schmincke Pure Yellow or W&N Winsor Yellow or DV Hansa/Arylide Yellow Medium. This is a lovely bright yellow. for even more transparency it could also be a PY150 yellow such as DS Nickel Azo Yellow but I like the purity of Hansa Yellow Medium. 4 - Hansa Yellow Medium mixed with Phthalo Blue RS PB15 DS to make bright greens. To make purples and reds and crimsons the very bright Magenta PR122 is required. This was not made by Daniel Smith when I created this post (I often wondered why not) but was added to the range in 2017 and is called Quinacridone Lilac. Is also available as Purple Magenta by Schmincke or Quinacridone Magenta in many other brands including W&N, Daler Rowney, Old Holland, and QoR. It is often used as a primary red pigment. I prefer the Schmincke version or the new DS version. The advantage of this pigment over my usual preferred PV19 Quinacridone Rose is that it will create a rich crimson when mixed with Transparent Pyrrol Orange. 6 - I mixed Purple Magenta with Yellow as they also make wonderful oranges, reds and crimsons. You can see how easy it is to create bright mixes of oranges, greens and purples. 9 - The last row is all three primaries mixed together to create a range of darks and neutral earth hues. Another very bright transparent and non-granulating pigment is Phthalo Green PG7. I use this for many mixes, especially to make a rich black with a crimson. I mixed it with the Purple Magenta (1 below) to see if it would neutralise to black. Like Quinacridone Rose, it makes great purples but not black. Mixes with my amazing quartet along with Phthalo Green PR7. 2 - I mixed a crimson hue by mixing Transparent Pyrrol Orange with Purple Magenta, then mixed that crimson with Phthalo Green and yes - blacks and aubergines are possible. 3 - back to my bright quartet colours, I tested the yellow to see what earth yellows I could create just with my initial 4 colours. Alone mixed with a purple made from the blue and magenta, hansa yellow medium creates some interesting cool earth colours. 4 - With a little orange added Hansa Yellow Medium creates yellow ochre and raw sienna hues and some raw umber options. 5 - I tried mixing a crimson from the magenta and orange then creating a phthalo green hue to try to create the same aubergine and black options. It comes close, though required all four pigments. I try to steer away from 4 pigment mixes but it is possible. My next tests will be with Ultramarine instead of Phthalo Blue RS to see if I can find a completely neutralising bright orange........ see here. Wow! These colors are gorgeous! DS uses R122 for their Opera Pink. It's obviously formulated different (like I know what that means) but I tried it out since that's the R122 I have and it seemed to work nicely. Very interesting exercise. Thanks for sharing your exploration. Lizzie you are correct but as Opera Rose also has a fugitive fluorescent dye in it I have not bothered to use it. They do have a lovely DS Quinacridone Magenta, but it is richer than the PR122 and doesn't produce the remarkable clarity of this set. What an amazing range to get out of these four colours. I have a little watercolour box with a limited palette of five colours, and love it, although I usually just can't resist buying those gorgeous colours and have a much bigger palette that I use at home. But I love limited palettes when travelling, and they're such good exercise for colour mixing and to get to know your colours. I usually base a limited palette around Burnt sienna, Ultramarine, Crimson (Carmine), a mid yellow and add an earth yellow or quinacridone gold to make 5. But then I add phthalo green to speed up the mixing and perhaps my Jane's Grey...this quartet could have Phthalo green added - its strong and bright enough - but a touch of yellow into phthalo blue creates a phthalo green hue so I think I'll continue to see what these 4 can do for a while. I've ordered these gorgeous four colours - just waiting for delivery. Can't wait to experiment with them. Thanks for all these tests and trials with different triads and combinations. Love your blog. Thank you Jen. I think you will be amazed at what they will do. Enjoy them! I made the colour mixing with colours I had at home. I changed the yellow to New Gamboge W&N PY153 and the blue to Manganese Blue Hue PB 15. I got some really lovely green and violet colours. The blue and the orange made some really interesting grey mixes. Some of the mixes got a distinct contour line around them. Kerstin the mixes with Manganese blue hue would be slightly more yellow as it is a GS rather than a RS but with the warmer New Gamboge they probably would end up similar. PY153 does leave 'edges' or contour lines which can be rather lovely. Jane, I absolutely love your ability to work magic with colors. The various hues you create and instruction is terrific! I've tried to do similar charts but I can't manage to reproduce such subtle graded hues walking from one color out of the tube to the other. Can you provide a tutorial or post on how you take say a pure ultramarine and a pure indian yellow and dilute to create the steps from one to the other with such precision and range? Oh, I just love playing with colors like this!!! Looks like you have both PO71 pigments like I do. LOL! Love what you share. I am passionate about this too. Thanks Renee. Yes I have PO71 in a number of brands. I use the DS version as my warm red as it is a definite red-biased orange. The other brands are gorgeous mid oranges but I notice that W&N and DS don't always get along in mixes! Have you noticed that? Oh, thank you, I found it! I need to practice using a limited palette and this one resonates wonderfully with me! I am beginning again after a long hiatus and want to work through a series of excersizes with these colors, just like a beginner in color theory, because I still am. Would it be very straight forward to transfer the info in your "Getting Started" or "Mastering" e-courses to using these (warm for warm, cool for cool) instead of the ultimate mixing set, or might it be just as well to just start with trying to replicate your swatches, here, then make a color wheel? This is a very limited palette that is quite different from my 'recommended' palette so it depends what you are after. Some people want to work with just a few colours. To do that you have to really understand colour mixing to make all the colours you wish to paint with. 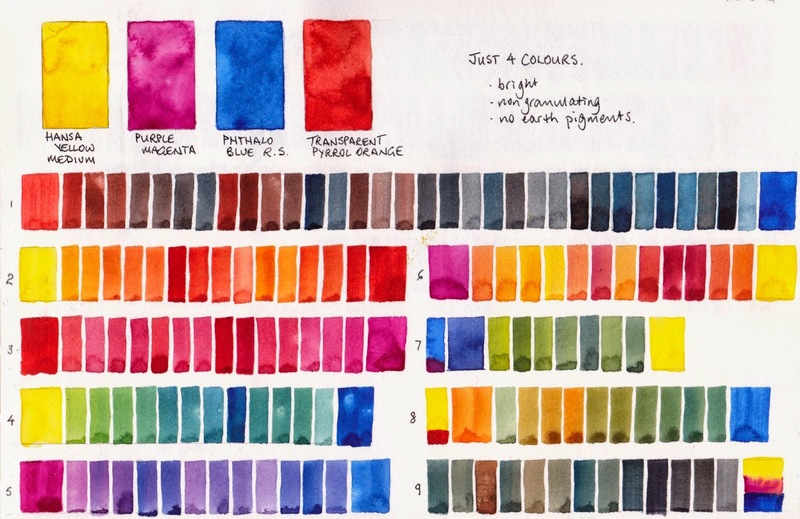 While you can create a warm yellow and a warm blue and even a cool red with this palette, you miss out on all the other wonderful watercolour characteristics that I like to explore in my on-line lessons. If you are planning to do my lessons, I'd suggest getting phthalo blue GS instead of RS and Quinacridone Rose instead of Quin Magenta. Ideally you'd also get pyrrol scarlet instead of transparent pyrrol orange so the only common colour is hansa yellow medium. Perhaps an even better limited palette to explore if you want to do my online lessons is Ultramarine, Quin rose, hansa yellow medium and burnt sienna PBr7 - you can do a lot with those and they are all in my ultimate mixing set. Ah, one of my old professors would call me his 'undisciplined colorist'. My wish would be to work out excersizes with both paths! To buy and explore this specific, unusual, but very 'me' palette, with the challenge of limited tubes, and the added confidence I know that would come through working through color with particular reference points that I think working through your 'Ultimate Mixing' book /course would provide. I will see about getting together the last pigments you mentioned. May I ask if your next book on triads will have excersizes, or if it will lean more to cataloging charts of possibilities through the worked out examples? I was happy to read that you have that project topic in mind! Well go for it then :-) The Yellow, Orange and Blue are Daniel Smith, the purple magenta is Schmincke - DS doesn't do a quin magenta with PR122. It's a remarkable mixer but not as lightfast as I prefer to use. The next book will have a huge number of triad wheels as well as examples of some further mixing of the triads and a painted example of many/most/all depending how I go with them all - not all triads are fun to paint with! Yes absolutely then you can get them all from the same company. Hello Jane, thank you so very much for this wonderful blog. I‘ve been reading here for years. You now have PR122 from several makers, though, based on the paint not the maker, which one would you recommend (considering all pigment characteristics and mixing potentials)? I've been using Daniel Smith watercolours for over 20 years so they are my go-to brand. I just like the way they dry in the palette and re-wet so easily. My favourite for the PR122 was the Schmincke, and if you only want a half pan or full pan of this pigment, that would still be a great option. Decide based on price or availability, but I do suggest avoiding W&N in this palette as I often notice that DS and W&N don't mix together smoothly. I don't notice that problem with DS and any other brands. Ahhh. I’m sorry Jane. I missed your answer. Thank you so very much for your thoughts about PR122. I already encountered the problem with W&N PR122 plus DS PB29. The mix separated in a strange way and this was not the typical effect you get, when adding a granulating pigment. Actually, these two didn’t mix at all. Well ... maybe it’s time to try the PR122 from Schmincke. Or get the new PR122 from Daniel Smith - Quinacridone Lilac. I haven't had any problems mixing DS with Schmincke - just with W&N. Appreciate all the info you put on your website! There are some really interesting non-granulating browns. I don't have a list, though my post showing all the DS colours does indicate which are granulating and which are not. Look at Permanent Brown, Quin Burnt Sienna and Deep Scarlet as well as Quin gold Deep and the new Raw Sienna Light.